30th March 2012. Announcing a "For Hire" category in the Classifieds; 20 copies of the book "Rhythms of the Kimberley" to giveaway in the Members Photo Comp; New article in our Australian Identity section; and great specials on new atlases and super special savings you don't want to miss! Read this newsletter now. Easter, school holidays, ANZAC Day, and the opening of the traditional "outback tourist season" will all soon be upon us. Don't leave things to the last minute - research, chat, browse, buy and sell online with us. A first for ExplorOz.com - we now accept listings "For Hire or Rent", and this means that you may purchase listings in the Classifieds to promote specific items you have available for Hire or Rent, such as satellite phones, accommodation, vehicles etc. To list in the "For Hire" category, you will need a Dealer listing - cost is $49.95 for a 3 month ad page. You can list any number of items during the time period and allows up to 7 images. As is standard for all "Dealer" ads, you may swap out items for others during the time period of your 3 month ad page using edit controls. Ideal for small businesses without their own website and no requirement for Business Membership. During the recent overall of our article section we have added a new section called "Australiana". As you travel and experience new parts of Australia, you might wish to look up facts on Nature, Culture, and History. This week, we added the first article to our Australian Identity sub-section in a timely prelude to ANZAC day coming up next month. The legacy of the ANZACs fighting at Gallipoli is said to have shaped the nature of the Australian identity. This article gives a brief summary of Australian's involvement in war, including the Gallipoli campaign, and discusses the significance of ANZAC day celebrations in modern-day Australia today. It also contains many shared poems, quotes, and links to YouTube video clips that have been posted on ExplorOz in the Forum over many years as a unified collection. This year, we urge you to place any ANZAC Day comments into the YOUR SAY section of this article, rather than posted in the Forum (however as you know, all article comments create posts in the Forum too). This is a nice way to keep everything together for future readers to enjoy! You'll also find some great Australian Stories listed in related shop items at the bottom of the article if you want to read more about the Australian Identity. See The ANZAC Legacy article here. 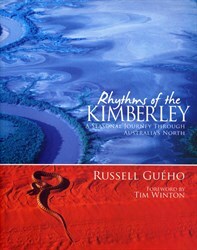 Pop on over to the ExplorOz Forum right now - see Thread ID: 92903 and you'll see details for how you can WIN a copy of the new book featured here in our newsletter, "Rhythms of the Kimberley". All you have to do is upload your best photo of the Kimberley. Hurry - we have 20 copies of the book to giveaway and these will be won instantly by the first 20 Members who share their photo in this thread. Winners will be contacted privately and prizes sent on the 10th April. Now's the time to update your old road atlas with UBD & Gregorys new Australian Road Atlases. Choose from Complete Motoring Atlas of Australia, Essential Atlas of Australia, or Maxi Motoring Atlas of Australia. If you travel to "see" and "experience"